What's Up? I'm Sailor Jupiter! Some things I like; cooking, sports, video games and occasionally fighting. But something sad you should know is that my parents died in a plane crash a long while ago. Maybe that's why I feel the need to get in fights...or maybe I just want to stick up for my friends! I'm pretty much a tomboy. I pick a lot of fights, (in fact I had to transfer 4 times for picking fights before Serena found me) But I'm always there to fight when my friends need me. 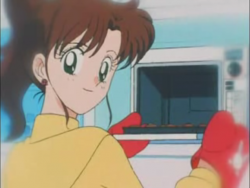 Here's a cool fact: I'm really the heroine Sailor Jupiter! I fight with the elements of the earth and storms against bad guys to protect the lives of others.